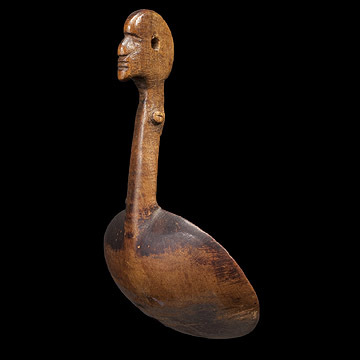 Carved from maple, this important early ladle depicts a Woodlands Indian in profile with coxcomb or braided hair. The unique corrugated panel on the figure’s backside may represent a wampum belt or beaded sash. The tiny nubs projecting from the sides of the handle are a previously unrecorded device, and are suggestive of arms and shoulders—artistically, they balance the thong hole within the center of the head. The piece is further distinguished by an untouched and remarkable surface.